If you have long hair, and have lived through basically any day, you have experienced frizz. Your hair decides it’s going to go wherever it wants, puff out in weird places, and stick to random objects. You can try out different hair care products such as shampoo, conditioner, and serums, but some days there’s just not much you can do. If you want to try one more method before throwing caution to the wind and living the phrase “long hair don’t care”, then you might want to try the Ionic Brush from Babyliss. This has active frizz control, and when I say active, I mean you’re going to need 2 AA batteries for this to do its job. 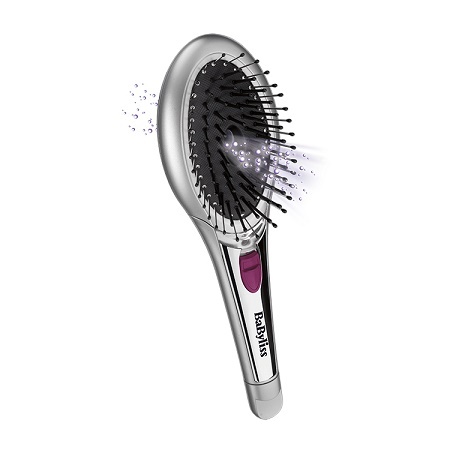 This is a cushion hair brush that houses an ionic generator that will put ions onto each strand of hair it touches, freeing it from static and smoothing the hair cuticle in the process. This looks like a regular brush with its plastic bristles, but with a hole that penetrates the front and back of the brush. This is where the magic happens, neutralizing the static charge of your many hairs. This is going to cost you around $44, and you will of course need to keep up with buying batteries if you want this to have its fancy function rather than just being a regular ole brush. Of course, you may need to do more than a few passes for this to really do the trick, but it could save you some money on experimenting with other methods.